Dr. Hokokian is the sole proprietor of Hokokian Chiropractic. He has been practicing chiropractic since 1989. 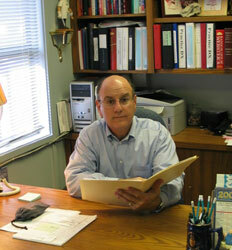 His practice emphasizes families and all of their needs. Many come to his office with neck pain, lower back pain, shoulder pain, and headaches. Some may have been involved in automobile accidents, personal injuries, work related injuries, or sporting injuries. His many years of experience have provided him the opportunity to treat these various types of conditions. His belief is that the family comes first and he likes to provide health care for the entire family. No one is too young or too old to enjoy the benefits of chiropractic care. As a chiropractor, he puts nothing in your body, (e.g. prescription medication), and he takes nothing out of your body, (e.g. a surgery). Dr. Hokokian works with your spine and extremities to make an effect on your nervous system, enabling your body to function at its optimum level. Disorders of the spine can compromise a patient's overall health and affect ergonomics and activities of daily living. Dr. Hokokian's focus on the functional and mechanical aspects of the spine while guiding his patients on the "Do's and Don'ts" of proper mobility is an integral part of his patient's wellness education. He understands the benefits of nutrition and provides nutritional counseling. Some may require a referral to another health care specialist, which he will be glad to provide. After graduating from chiropractic college and returning to Fresno, he associated with Pack Chiropractic Group where he practiced for 5 1/2 years before opening his own office. He maintained membership in the Rotary Club of Fresno for over 10 years, and he earned his Eagle Scout Award in his youth. Recently, he completed Dr. Arthur C. Croft, PhD, D.C. year long course study, "The Whiplash Injury Biomechanics & Trauma." This is to enhance Dr. Hokokian's skills in the treatment of those who have been involved in automobile accidents. Dr. Hokokian is a Fresno native and attended California State University, Fresno and graduated from Palmer College of Chiropractic-West in 1989. He is married to Vicki Hokokian and they have two children. Vicki is in private practice as a Certified Public Accountant. Their son, Christopher, graduated with honors from San Diego State University (SDSU) where he played on the Aztec Football team. He majored in Business Administrations - Finance. Their daughter, Alina, is a sophomore at SDSU, majoring in Communications. During the past 4 years, Dr. Hokokian has had the opportunity to work side by side with a Board Certified Interventional Pain Management doctor. This experience has proven to be invaluable to further enhance his skills as a doctor of chiropractic. The doctor has been a member of California Chiropractic Association (CCA) and Central Valley District - CCA for over 20 years. He is licensed by the Board of Chiropractic Examiners and the State of California Department of Industrial Relations-Division of Workers' Compensation Medical Unit as a Qualified Medical Evaluator.